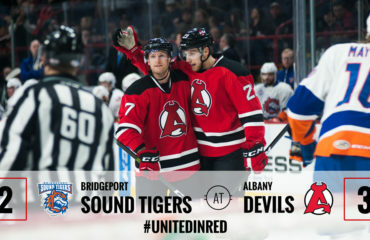 ALBANY, NY — For the first time in four meetings this season the Albany Devils fell to the Rochester Americans, 5-3, Saturday at Times Union Center. 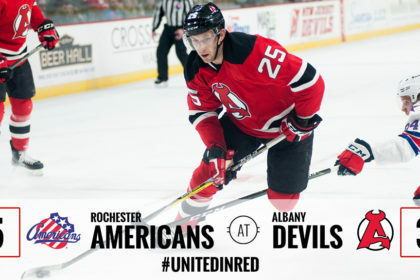 The Devils scored three goals in the first period but Rochester scored five unanswered goals to secure the victory. 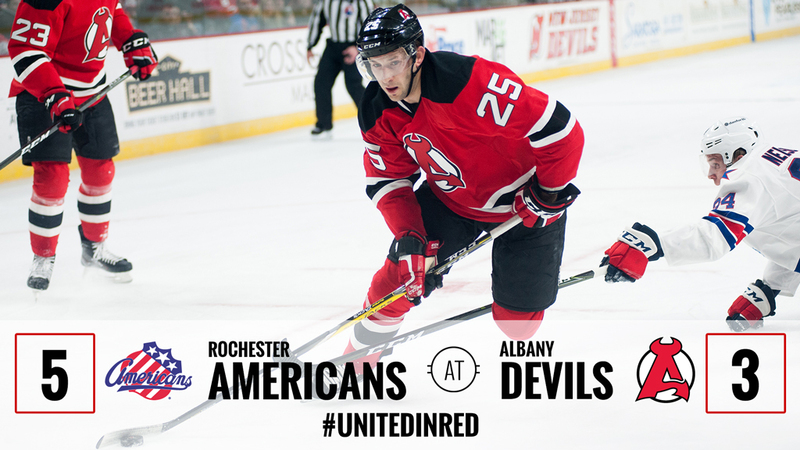 Albany’s record moves to 25-17-1-1 as Rochester ends its three game losing streak and improves to 19-24-0-2. Blake Coleman opened the scoring for the Devils at 10:41 of the first period with his team-leading 14th goal of the season. He buried the puck after Yohann Auvitu’s shot got through the legs of Rochester goaltender Linus Ullmark. Brian Gibbons picked up the secondary assist on the goal, his 12th of the season. Auvitu added to the lead with his second goal of the year at 13:08 off a John Quenneville assist. The goal was his second in two games. 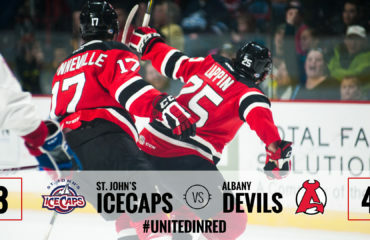 Nick Lappin capped off the first period scoring at 17:44. 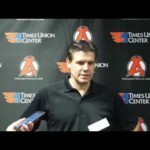 He was able to deflect a Seth Helgeson shot for his second goal in 11 games for Albany, and first since being recalled from New Jersey. For Helgeson, it was his first point since his eight game stint in the NHL. Carter Camper picked up the secondary assists, his 13th of the year. 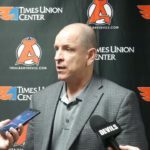 Daniel Muzito-Bagenda scored Rochester’s first goal of the game at 7:26 of the second period and was quickly followed by a Vaclav Karabacek tally at 8:24. 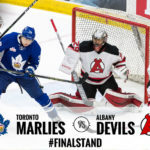 Cole Schneider then tied the game at 11:26 of the period to erase the Devils’ three goal advantage. 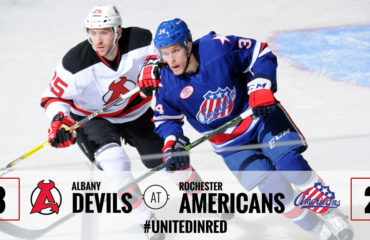 Tim Kennedy scored the game winning goal at 10:08 of the third period after he found a loose puck in front of the net and Justin Bailey notched his 18th goal of the year at 17:00 on a four-on-three power-play to seal the game for Rochester. 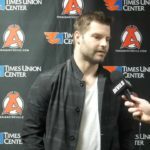 Ken Appleby had 21 saves on 26 shots and Ullmark stopped 21 of 24 shots. 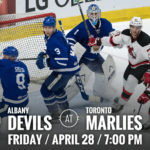 The Devils host the Syracuse Crunch Thursday for a 7 pm puck drop.